A rainy Friday morning did little to dampen the atmosphere at the inaugural SEA 7s. Excitement was in the air at Yio Chu Kang stadium as the Singapore teams prepared to dazzle the home crowd. In the Men’s groups, Singapore fielded two teams. 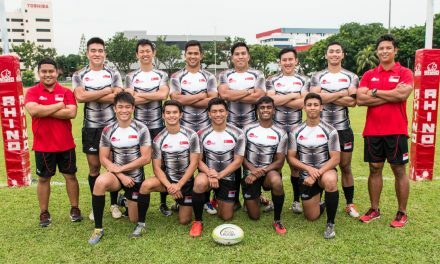 One team (Singapore) comprised of 7s stalwarts such as Sidney Kumar and captain Daniel Marc Chow, while the other team (Singapore A) was largely made up of budding U20 talents under the leadership of Hargaven Singh and Tee Liang Sheng. Team Singapore breezed through the Men’s Group A with performances that had the crowd cheering. 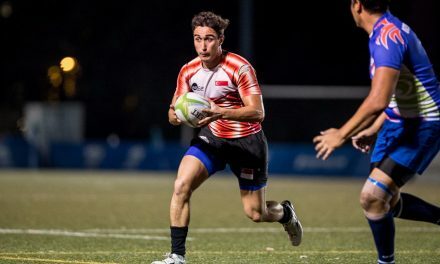 While the weather was not optimal for 7s, when in possession, Team Singapore was not afraid to throw the ball wide to capitalise on speedsters such as Bryan Ng and Daryl Chia. Quick to pounce on opponent errors, a bulk of possession backed with sleek interplay quickly established Team Singapore’s dominance atop Group A and secured a finals placing in Day 2. In the Men’s Group B, a young Singapore A dared to dream and faced the challenge head on. Squaring off against regional heavyweights such as Thailand and Philippines, each time Singapore A took the field they put up stiff resilience with highly physical performances. However, experience is still a key ingredient in Rugby, especially in 7s, and it quickly showed. 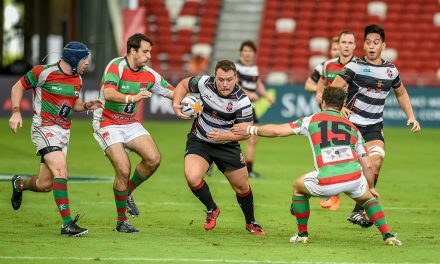 Singapore A lost each encounter by respectable margins, the closest of which was to Malaysia 21-12. Nevertheless, a never-say-die attitude helped Singapore A round off the day with a convincing 28-0 victory over Indonesia. Concurrently, the Singapore Women’s team did well to match their Men’s counterpart by rounding off Day 1 having ensured a spot in the finals. This team only had two players (Alvinia Ow Yong and Christabelle Lim) who played in the 2015 SEA Games 7s, with five players making their debut at this tournament. Recovering well from a 29-5 drubbing from tournament forerunners Thailand early on in the day, the team rallied behind Captain Alvinia Ow Yong to brush off Laos 28 -7, before going on to physically dominate and grab victory against an aggressive Philippines side in the semi-finals. The Singaporean teams rounded off the day with both the Men’s and Women’s earning a spot in the finals against Thailand, while Singapore A held its ground firmly against much more experienced teams before bowing out 7th. Q: Congratulations on topping the table; the team played well! What went right for the team today? Everyone stuck to their roles and the team discipline was very good. We didn’t try to do too much and we managed to go far with good basics. Q: Going into the finals against Thailand, what things are Team Singapore going to look to tweak and improve? Thailand is a speedy and skillful team that will do damage if they have possession, so we are looking to improve in our continuity and securing ball possession. Q: Name a Forward and Back of the day! Bronson Ro and Charlie Teng Chong Yao. Q: A highly physical affair in the semi-finals and a job well done against Philippines. The team looked really well gelled towards the end, what was the training regime like? We trained thrice a week since January. Every session was very intensive as 7s is very geared towards having high fitness levels. We only have 2 of the players from the previous SEA Games Squad from 2015 so it’s good that the team managed to gel well over the past few months. Q: The Thailand Women’s team are the favorites to win; it’s been this way for a while, seeing that they also won the SEA Games in 2015. What’s on the team’s mind before the finals tomorrow? We definitely do not have revenge in mind – we just want everyone to help achieve this team’s full potential in the finals. Q: A tough day at the office facing all the heavyweights in SEA; the team did well to keep their heads high, but is there any area where this team would look to improve in? Team discipline – we have to choose which area of the field we want to play in and we should keep in mind that we have to play a territorial game at times. Q: Seeing that you are the most senior player in a team of young players, what did you emphasise in this team? I tried to drill it into the team that communication is very important. It is only through communication that the barriers between teammates will come down.